Thank you for celebrating the River of Light Grand Finale! Last weekend’s River of Light grand finale was magical. As darkness fell in the wooded park, more than 200 lanterns illuminated our collective experience of nature and community. Over the two evenings, nearly 250 people celebrated our work. I extend a huge and heartfelt thank you to everyone who made a lantern over the past four summers, to all the people who showed up to help with the installation and tear down, to the musicians and storytellers, the photographers, and everyone who came to enjoy a peaceful walk through the woods at night, with the light sparkling among the trees and along the water. Thank you! River of Light Grand Finale – Fri & Sat! This weekend’s River of Light grand finale promises to be magical. Over the past two months, more than 100 people have helped make lanterns, including nearly 30 in the last two weeks. These incredible illuminated sculptures, which include colourful ducks, a Canada Goose, a fox, orange cat, a mayfly, salmon, and our completed enormous sturgeon, will be installed in the woods and park next to the studio. They will be placed in conversation with all the lanterns made over the past four years, to create a beautiful River of Light as night falls. As my artist residency winds up at the end of this year, this will be the last River of Light. Don’t miss it! The River of Light community lantern installation will be up for two evenings: tonight (Friday August 24) and tomorrow (Saturday August 25) from 7 – 10 pm. You can invite friends, family and neighbours via Facebook. Because of the high interest in the event, parking will be very limited. Please carpool, take transit (bus 733 from Haney Place Loop brings you right here), or park at Maple Ridge Park and walk along the trail to the studio. Limited parking is available in the lot at Cross’ Cabins Park, Upper Maple Ridge Park and in neighbouring streets. 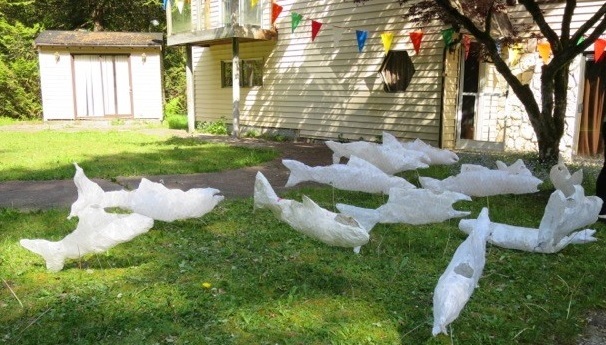 On Sat Aug 25, in addition to the lanterns, City of Maple Ridge Artist-in-Residence Kat Wahamaa will host an evening of river songs and stories in the park from 7:30 pm – 9 pm. Join us for a magical evening! Volunteers are needed to help set up and take down the lanterns each evening. Let me know if you can help. Set up will start at 5 pm. Bring a picnic dinner and make an evening of it! Getting ready for a River of Light! 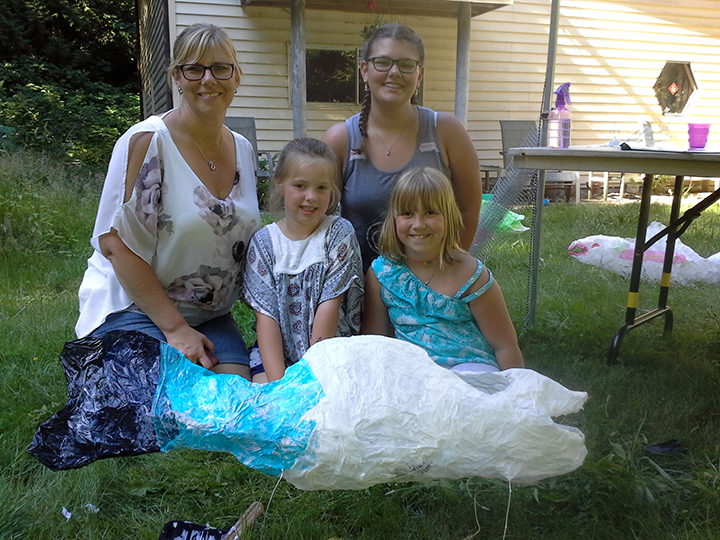 Over the past few months, community members have been busy creating lanterns for the grand finale of the River of Light community lantern installation. On August 24 and 25, from 7 pm – 10 pm, more than 100 handmade lanterns made by community members over the past four years will be installed in Cross’ Cabins Park and at Davidson’s Pool. As night falls, the lanterns will create a magical, illuminated path through the woods and sparkling along the water for all to enjoy. Make a lantern this BC Day long weekend! Tap into your creativity this long weekend. Join City of Maple Ridge Artist-in-Residence Robi Smith for a free workshop to learn how to make a beautiful lantern as part of the River of Light project. All workshops take place at the Artist-in-Residence studio at 23740 Fern Crescent (on the same property as the Maple Ridge Lapidary Club). All ages and abilities welcome (children under 12 must bring an adult along to help with the tricky bits). 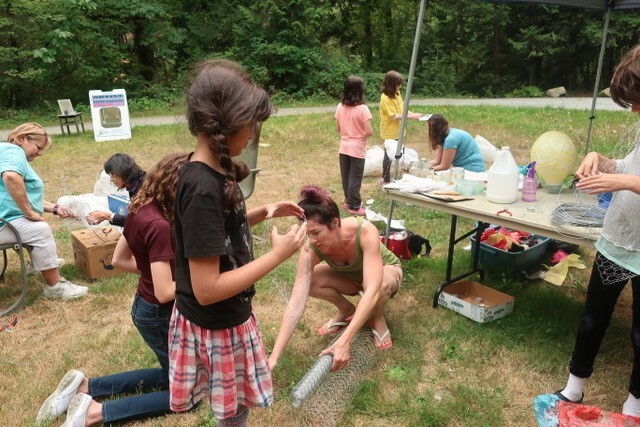 Over the past four summers, more than 100 community members have made lanterns in the forms of different species that call our local rivers home: ducks, salmon, crayfish, heron, dragonflies, butterflies and more. This year the lanterns will be installed in Cross’ Cabins Park adjacent to Davidson’s Pool, creating A River of Light, over two evenings: Friday, August 24 and Saturday, August 25. Starting this weekend, lantern-making for this summer’s River of Light installation begins in earnest. Join me for drop-in sessions where you can help build a giant sturgeon lantern or make a smaller lantern of your own design. Over the past few weeks, people of all ages have made lanterns in the shapes of salmon, koi, a duck, and a mayfly, as well as balloon-shaped lanterns for carrying. Others have been busy helping spruce up lanterns from previous years. On Canada Day, more than 75 people made glass jar lanterns to illuminate their way during the River of Light on Aug 24 and 25. Workshops are free and open to all ages and abilities. Children under 12 need an assistant to help with the tricky bits. The studio is located at 23740 Fern Crescent in Maple Ridge (map). RSVPs welcome. River of Light at Canada Day! Join me this Sunday at Maple Ridge’s Canada Day celebrations! Make your own lantern to carry during the River of Light community lantern installation at the end of August, or help build a giant collaborative lantern. The City’s Canada Day celebrations run from noon to 6 pm at Memorial Peace Park in downtown Maple Ridge and feature live music performances, the Haney Farmer’s Market, and interactive booths featuring local arts and culture organizations. In addition to making lanterns, hands-on art activities include painting your portrait to add to the Maple Ridge Pitt Meadows Art Studio Tour‘s Faces Over Fences public art project, colouring giant drawings created by yours truly and Maple Ridge artist Tammy Routley, and creating street art / chalk drawings, including a large chalk mandala that I’ll spark in the alley beside Subway on 224th St.
Stay tuned for more lantern-making workshops at the studio this summer. Details here! Art Studio Tour this weekend! This Sunday, May 13, you’re invited to visit my studio during the Maple Ridge Pitt Meadows Art Studio Tour. Drop by between 10 am to 4 pm to learn about my community art projects as Artist in Residence with the City of Maple Ridge, see my latest paintings, and find out about upcoming workshops. **Please note: while the Tour happens both Saturday and Sunday, my studio will only be open on Sunday. The Art Studio Tour features more than 40 artists in 25 studios and galleries in two communities. To learn more, visit artstudiotour.ca. My studio is at 23740 Fern Crescent in Maple Ridge. Click here for a map. I look forward to seeing you!